Those who taste, know. It is a bizarre concept for those who have never experienced a lucid dream to even imagine what it is like. So many things happen in dreams, but people usually do not realize that the only explanation is that they are dreaming. Imagine that you are in a world of your very own creation. You, by the standards of the physical and social reality, are fully capable of doing the impossible and consciously influence the outcome of your dreams. In this article, we will try and follow a few simple steps that can help you enter the world of lucid dreaming. Many people think that they don’t dream at all, where in reality we all have 3 – 8 dreams every single night. The problem is, we tend to forget them. So what we would suggest is to keep a dream journal ready by your bed side to scribble down any details you may remember from your dream once you wake up. If you remember nothing, just write down you remember nothing. This will help train your brain to remember dreams and improve on their vividness. The next thing you may want to do before jumping into the drivers seat is to perform reality checks. Pick up anything around you with writing on it; a digital watch, a coin, anything really. Look very closely at it, feel it, know how that is. Now read what’s written on it on both sides. The next time you pick it up, read what’s written on it again. Ideally, nothing has changed. Now to test if you are awake or not, stare at the words really hard. Nothing changes if you are awake, but if you are dreaming you will see that you are capable of altering the words. That is one way of checking whether you are dreaming or truly awake. The trick with those reality checks is that you may want to do them often when you are awake, this will then become second nature to you and carried over into your dream state. You are more than likely then to perform those reality checks in your dream. When you do perform those checks in your dream, you will figure out something is wrong and know that the physical reality around you has been altered. Trying to remember the future sounds a bit odd, but that is what needs to be done next. The most powerful technique to induce a lucid dream rests on the simple idea of remembering to do something. Try to tell your mind to wake up from a dream before you go to bed and try to recall it as completely as possible when and if you do. Before returning back to bed, keep telling yourself with full intent that you are going to have a lucid dream. Imagine you are back in the dream you just woke up from as you are telling yourself you will have a lucid dream. You will see yourself slowly slipping into the dream while your brain is still awake. Try to look for any signs that may prove that you are dreaming and tell to yourself that you are indeed dreaming. Keep repeating that until you find yourself lucid in another dream. 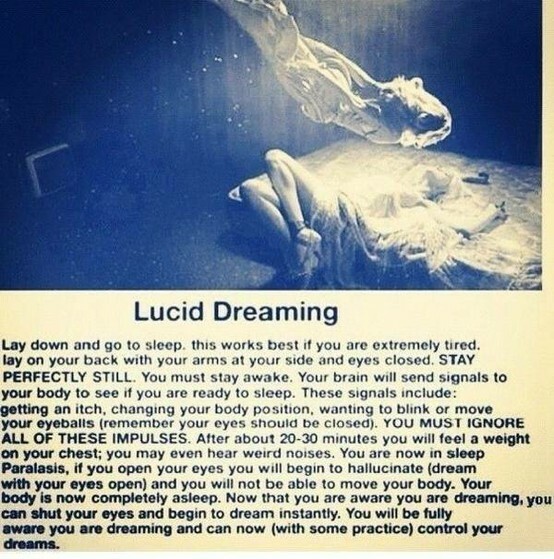 This exercise is called a Mnemonic Induced Lucid Dreaming (MILD). Give it a try and let us know what you think. In the next article, we will talk about other techniques to induce lucid dreaming and we will try and expand on the possibilities of things that can be accomplished in lucid dreaming. Until then, enjoy awakening in your dreams. This entry was posted in Brain and tagged beautiful, brain, dream, lucidity, sleep by TheChadi. Bookmark the permalink. To know me is to travel with me. Follow me, keep discovering. Pingback: Dreams-Do Spirits Visit Us in Dreams?